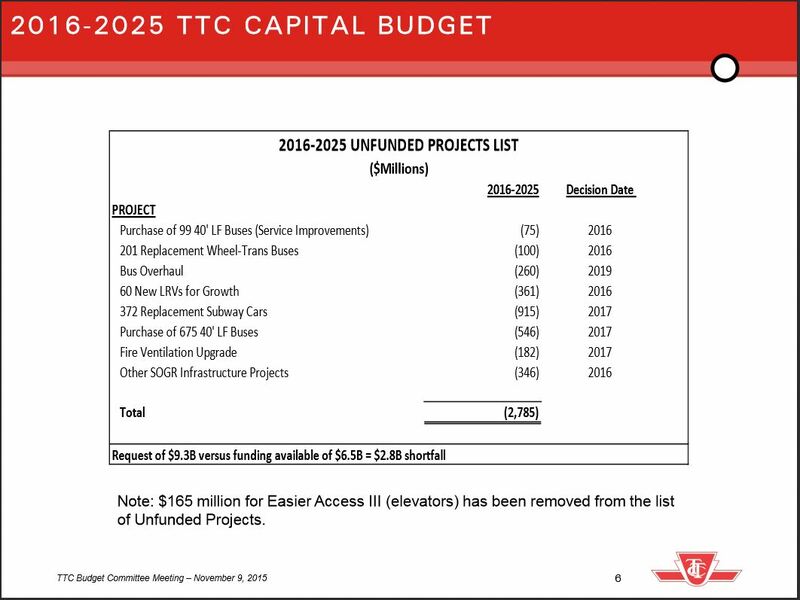 The question of project prioritization comes up every time the TTC looks at its capital plans because there is far less money available than the plans cost in total. What was once a problem for the medium future now stares the TTC (and the City) in the face for the 2017 budget round. The chart below shows the mismatch between TTC capital needs and available funding. The TTC requires $9.3-billion over the coming decade, but known funding will only cover $6.5b of this. The gap is trivial in 2017, but it quickly rises as various funding schemes wind down. Of particular concern is the availability of City debt which effectively ends in 2020 and does not return to 2025 (this chart may actually be optimistic considering other spending plans the City might undertake that will further crowd their borrowing room). The cap on new debt is a result of a self-imposed rule that debt service costs must not exceed 15% of tax revenue (which itself only covers about 1/3 of the total City operating budget). Under provincial legislation, the City could go up to 25%, but they have always preferred a conservative limit and this helps with their bond ratings in the financial market. The only way under this scheme to “afford” more debt is to raise revenues, either general tax revenue (which increases the base on which 15% is calculated) or an earmarked tax such as the Scarborough Subway tax (which in 2016 and beyond will be 1.6% over the basic property tax rate). Those which are little more than a footnote, but which can be very expensive such as the Relief Line and major upgrades to the Bloor-Danforth Subway. The list below shows the unfunded projects, i.e. “below the line”. Note that there is a lot of duplication between the “additional” list and the other pages, and that some projects show up here only as studies because the big spending on construction would happen beyond the 10-year planning window. There is a fundamental problem: the 10-year capital plan omits a very large amount of potential spending, some of which will be difficult to avoid. However, for political reasons it stays out of sight as only a footnote making the problem look less dire than it really is. Into all this comes the need for project evaluation and prioritization, especially for the big ticket items. Because they languish out of sight as “nice to haves”, some of these never get the attention they deserve, but loom as potential ways to spend money whether they are actually needed, or the most important. This became evident when the Board asked about prioritization if new infrastructure money came available from Ottawa. Management’s reaction was to talk about major upgrades to the B-D subway (line 2) including new signals, cars and maybe a new yard even though the actual need for more capacity has yet to be demonstrated. Indeed, Metrolinx demand projections for the effect of a Don Mills Relief Line show a considerable decrease in demand on at least the Danforth side of the B-D line. As for spending on a new yard, money for this is already included in the Scarborough Subway Project. There are many potential calls on new Federal spending, including simply fleshing out funding for the SOGR projects sitting in the base budget, or even accelerating some of them if cash flow allows (notably accessibility improvements). What is not yet known is whether the Harper government’s “support” for the Scarborough Subway will come out of the new Liberal spending pot, in effect pre-empting a large chunk of capital for this project. Prioritization will also trigger a debate on the likely sequence of new subway (and LRT) construction plans, to the extent that these projects are undertaken by Toronto and the TTC rather than by Metrolinx. Some hobby-horses will have to be put out to pasture such as the Sheppard West connection, but there are Councillors who simply will not accept that this project does not rank highly against many others, notably improved capacity into the fast-growing core area. Service quality, although an operating issue, has implications for capital in its effect on fleet size for peak service and, hence, garaging requirements. Toronto has lost at least four years, probably more, in understanding and dealing with its capital spending needs on transit. Between creative accounting and fictional revenue sources, beside which the Tooth Fairy is more reliable, City Council and the TTC have avoided a real debate about what transit should be beyond a few vote-getting projects. With the real size of the backlog hidden away, other governments can treat the situation as small enough for an occasional, election-based intervention rather than dealing with a fundamental need for ongoing capital funding. It is not enough to say “give us more” – Toronto must understand what it needs, what each project will contribute, and how important each one really is to the city, not to the ballot box. The finalized costs up to 2014. These can include some changes from the previous budget because of variances between “probables” and “actuals” in 2014. The probable spending in 2015. The budgeted cash flow in 2016 through 2025. For 2025, as a new entry in this table, there is no “previous” budget amount. The projected spending beyond the 10-year window (2026 and beyond) for long-running projects. The Estimated Final Cost (“EFC”) of the project. There needs to be some more funding votes at city council similar to the Scarborough subway – a waterfront lrt plan, a drl tunnel plan, and a bus plan – all with dedicated tax increases. TTC should put the three plans forward separately so they can each be individually debated and funded. There are a few anomalies I noticed in the capital budget, maybe you have an insight into these expenses. Steve: This is probably contingencies and provision for contract claims, but until the Blue Books come out, I won’t see the details. 2) Almost 50% of the capital spending on the fare system (Presto?) will occur in 2017 through 2019, yet the TTC website still shows that Presto will be available “throughout the entire TTC by the end of 2016”. Steve: I believe that this is the continued rollout of the new turnstiles. 3) Over $38M in capital spending on service planning over the next 10 years. That is a lot of money for new signs and posters, considering that staffing costs is an operating and not a capital expense. Steve: Service Planning “owns” Transit Priority Signalling projects which account for about $30m of the total in two budget lines (one related to the “Transit Opportunities” report). Individual projects are listed starting at page 51 of the budget report. 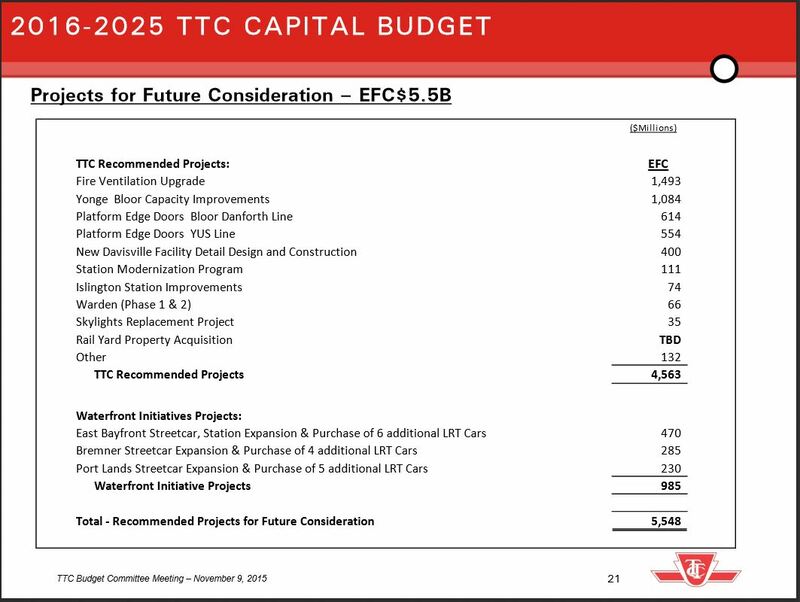 When the City modifies signal controllers to include transit vehicle sensing and new controller hardware/software, the money comes from the TTC Service Planning capital budget, not from City Transportation. I believe that this is the continued rollout of the new turnstiles. but work will continue for a while to replace the remaining non-Presto turnstiles. That sounds plausible but a bit odd. If there are still some non-Presto turnstiles, how do you get through them? Will tokens remain in use for a couple of extra years? I didn’t think that was the plan. Steve: No. The TTC is replacing all of its turnstiles with new machines common in other cities that have barriers that pop aside to let you in (or out). The old turnstiles will have Presto readers on them, but they will eventually be replaced. 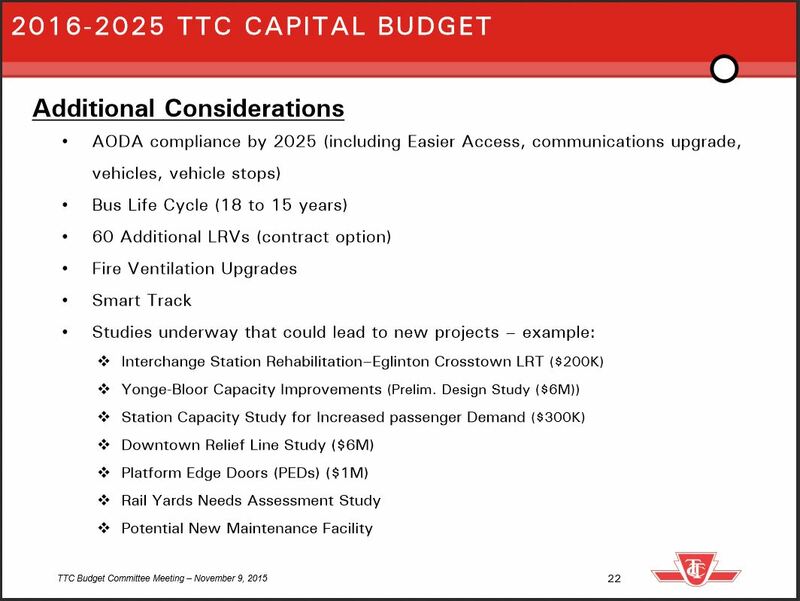 How can Warden and Islington still be considered “projects for future consideration?” Don’t AODA requirements essentially mandate that these two stations be renovated by 2025? Even assuming that you can get away with only starting by 2025, rather than being finished, I would imagine a project like that would require a lot of time to plan and prepare. How can these two not be on the 2016-2025 unfunded projects list? Steve’s commentary’s humourous tone gave me a good laugh. Lots of wisdom there. As a professional accountant in my previous phase of life, I know to start reading financials from the back towards the front. The goodies are all in the footnotes and explanations. To take Steve’s example of reading the phone book, I would start with the Z’s. Would not Zzyzzyla, Zoltan at 99 Zephyr Dr. tel. 905-951-9989 be a lot more intriguing than AAAA Auto Supply? Steve: There’s a reason I read the “Blue Books” every year, and also plough through the footnotes to the financial statements. Lots of useful info deeply buried. Likewise, of the four charts presented by Steve, it was the last one that got me thinking about all sorts of transit fantasies. Of the “Additional Considerations”, unfunded and unbudgeted, I think that the first 5 bullets are pretty straightforward. The 5th bullet is SmartTrack, it made the list. The 6th bullet, “Studies Underway that could lead to new projects” is broken down to 7 items, of which I will comment on some. Steve, do you know what is meant by “Interchange Station Rehabilitation – Eglinton Crosstown LRT”? I would assume that this is not Yonge-Eglinton station, because the rehabilitation/rebuild of this station with regards to LRT is a must-have, not a nice-to-have-someday. Steve: Eglinton is in need of a makeover that has been on hold for years pending construction of the new line. The Metrolinx budget will cover their station and connections between the lines, but the existing station is the TTC’s. Next, “Downtown Relief Line Study”, they’ve surprisingly reverted back to the old name which was politically incorrect. Steve correctly calls it “Don Mills Relief Line”. So, to my chagrin, the DRL, whatever the letters stand for, is relegated to the very very back of the budget, along with “Potential Maintenance”! And speaking of transit fantasies and DRL, I got to thinking. I like the idea of the DRL running the full length from Sheppard to Downtown, and studies strongly support the idea. So, here is my fantasy: how about if the DRL were planned not from Downtown up, but from Sheppard down? First phase extend Sheppard subway south along Don Mills Road to meet with the Eglinton Crosstown LRT. Simpler and easier to do. Steve: Actually not easy given that Don Mills Station is east of the intersection. Like the Roman policy of divide & conquer, chip away at the problem, and the tough part will eventually solve much quicker. Steve: That attitude was used to building the Waterfront West LRT a tiny bit at a time with the result that we have a route that is less than ideal and without protection for some critical routing options. The first phase will not be stranded from the rest of the subway system, and it allows the temporary usage of shorter train sets. This phase ought to be the easiest to build, since most of it would be above ground. Once it is operational, demand will pretty much force phase two, to connect with the B-D subway line. And phase three, the Downtown portion, will follow like a dog on a leash. Like I said, just a fantasy! First phase extend Sheppard subway south along Don Mills Road to meet with the Eglinton Crosstown LRT. Simpler and easier to do. Actually not easy given that Don Mills Station is east of the intersection. Continue just east of the station where the line could curve to the south about 135 degrees so that its furthest east point is just west of the DVP. Continuing on this tangent trajectory would have it heading for enough north of the intersection of Don Mills and York Mills to allow it to curve to follow Don Mills. There could possibly be a stop about half way along Graydon Hall Drive. Steve: First off, this design would kill off the plan to have a “level” connection between the subway and the Sheppard LRT using a shared continuous platform. That said, the real issue would be how to thread the line under various neighbourhoods on its route back to Don Mills Road. Lots of fun for the fantasy line drawers, but I just wish we could focus on the fundamentals of getting a DRL built rather than stuff like this. Frankly, when I wrote about the problems of capital spending priorities, I didn’t want to start yet another thread on fantasy maps which infest too many transit discussions. For reference, here is a map of the design at Don Mills Station taken from the Sheppard East LRT EA. Does this mean the end of the vitrolite tiles at Eglinton Station, the last one with them from the original Yonge line? If you Google Vitrolite one of the images that show up is Eglinton Station. Steve: Don’t know the details. Even Eglinton contains tiles from elsewhere (Wellesley) salvaged with some difficulty. It looks like the approved budget has bit the bullet and fully funded the legally required Easier Access III / AODA upgrades. But I have trouble reading this budget. Can you confirm? Steve: Yes, the AODA stuff has been moved “above the line” into the funded portion of the budget. I’ve never really understood the fetish for a level transfer. Why is a 100-150m walk (1 to 2 minutes, typically) preferable to a 20s escalator ride? You can increase circulation capacity vertically by adding more stairs/escalators/elevators, but horizontally the only way is to widen the platform. Steve: The “fetish” is a direct effect of the appallingly inconvenient transfer from subway to RT at Kennedy Station. If transfer we must, then nothing less than a level transfer is “acceptable” in some circles. I’m personally fond of direct vertical stack transfers (“lower platform” and “upper platform” stacked directly on top of each other) — they make for very easy stair and elevator transfers — but they’re not common outside New York City, so the concept may be too alien for most Torontoans to comprehend. Steve: Ever been to St. George Station? It would be even better if the north bound line 1 trains and west bound line 2 were on the same level with the east and south bound on the other level. The major direction change would be cross platform. Unfortunately the station spacing and the fact the University subway opened about 3 years before BD. Bay is also a stacked station. Considering the amount of money and design effort the TTC spent on the whole idea of three-route interlining operation through the Bay/St. George/Museum wye, I’m sure that a cross-platform transfer at St. George could have been implemented. However, the whole thing was set up for interlining, which in theory would have removed at least half the transferring traffic at St. George. Montreal Metro’s Lionel-Groulx station uses the stacked-platforms/intermixed-lines arrangement. It’s great for those who make the same transfer everyday, but somewhat counter-intuitive for those new to the system. It’s a bit of a moot point though, as there’s no easy way to retrofit that into an existing station at either Don Mills or (especially) Kennedy. Steve: Oddly enough, Kennedy is actually a stacked station, but the distance between the two rail services is long and the route is not well-designed, especially outbound to STC. Speaking of capital spending priorities, I’ve noticed the TTC putting out new bigger and fatter traction poles on Queen, Dundas, Carlton, Gerrard and other places. On Queen St West for example, where there used to be two poles for the span between University and Simcoe, there is now a third fat pole in between, which to my untrained eye seems highly unnecessary. In some of these areas (eg. Regent Park) they are going up right next to recent vintage traction poles which look to be in perfect shape. Have you any idea what’s going on with this “interesting” program? Steve: There is a multi-year program to replace all of the traction poles, feeder cables and contact wire. It is entirely possible than an area that was rebuilt comparatively recently was not correctly catalogued. It isn’t surprising to see oddities like this.